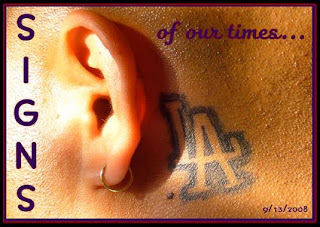 The Studio for Southern California History, a nonprofit organization located at 525 Alpine Street Suite 103 in Chinatown, will showcase Signs of Our Times September 13, 2008 - August 1, 2009 from 6:00 PM - 10:00 PM; The opening reception is 6 - 10 pm. The Studio’s hours are Wednesday through Sunday noon to 8:00 pm. This FREE exhibit explores changes in Southern California including transformations in the landscape, pivotal legislation & awe-inspiring events. The kid-friendly exhibit includes a massive Timeline, Community Quilt, the LA History Pinball machine, a real pinball machine designed after the layout of downtown Los Angeles, and the Wall of Southern California Neighborhoods. For more info, call (213) 229-8890 or click the title link. I think I need that tatt somewhere, I'm running out of room for real though. Meow.